The Cristobal Colon Spanish School is situated in Quito, Ecuador. The language school is located just 3 blocks away from the main tourist area of the city. Below you can find out more about this school, observe course details and read the student reviews. Use the green button at the bottom of the page to book a course at Cristobal Colon Spanish School. School info: Founded in 1997, the school offers a hostel attached to the school, 2 terraces, kitchen, free internet service, located in the heart of Quito. Situation: Located 3 blocks from the main tourist centre in Quito, near shops, restaurants, bars, museums and attractions. Adjoining the Cristobal Colon Spanish School is their own hostel offering accommodation for the students and also for international tourists alike. The Tutamanada Hostel has a range of rooms and a large lounge complete with cable television and stereo. The hostel also offers 2 terraces, a fully equipped kitchen for guests to use, a safe, laundry machine and free internet connection. The school was founded in the year 1997 on the 4th of April and it offers a variety of Spanish courses; there are intensive courses, regular courses and perfection courses. The intensive courses are shorter and are aimed at tourists who wish to learn enough Spanish to be able to communicate whilst visiting. The regular courses are designed for those students who want to learn Spanish in a calm and organised manner, there are 3 levels beginner, intermediate and advanced. The perfection courses are literally that, they are aimed at those students wishing to perfect their Spanish and also learn about the origins of the language itself. Description: Quito has the stunning backdrop of the Pichincha volcano to set it off and the glorious sky tram that offers its passengers the opportunity to observe the volcano at closer quarters as they climb up it. 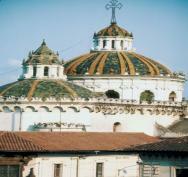 Quito has shops, restaurants, bars, museums and much more to offer.